They dared to burst the bonds of convention! He never would have learned about his wife, if he hadn’t come home so unexpectedly that time … And discovered her with Evelyn! Nor was that the worst of it. Mike Canning found himself another love to replace the one Evelyn had stolen. Dark-skinned Roberta, a West Indian beauty vibrant with the torrid passions of the tropics. But this girl, too, the evil Evelyn lured away—contaminating her, spoiling her for the normal life shared by men and women. And so formed the strange triangle, the triangle of sin: warped Evelyn Carruthers … darkly sensuous Roberta Thompson … and Mike’s lost, strayed or stolen wife, Ann. 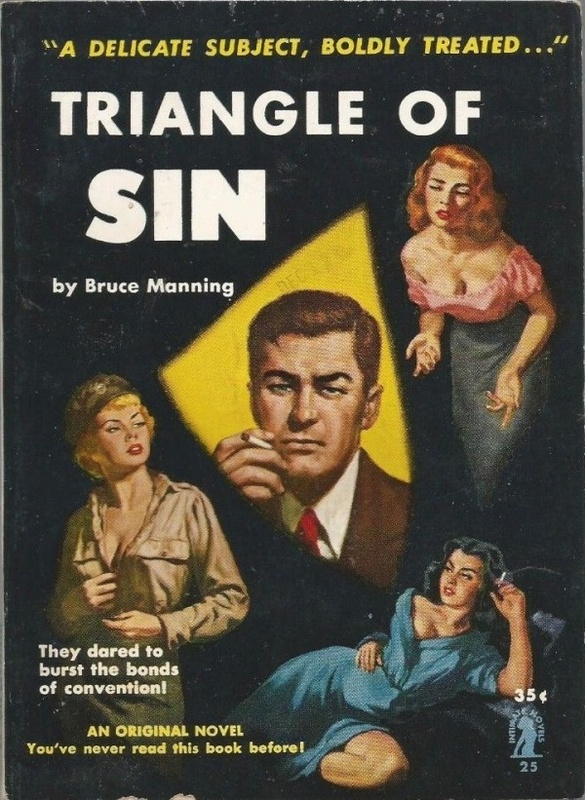 Could Mike Canning, in his warm, ardent love, storm the defenses of the sinful trio? And if so, which of the fair maidens should he rescue?